The Pro-Cap has a big five inch diameter with two full inches between each terminal! This ensures accurate spark delivery and far less chance of spark scatter inside the cap. The entire assembly is injection molded from Dupont ® Rynite™ material for incredible strength and high dielectric properties. The Rotor features a deep skirt and thick vanes to stir up the air to prevent ionization and the rotor screws are even overmolded with Rynite for increased spark isolation. The extra thick rotor tip can easily handle high heat and is indexed and firmly secured with two screws. The Pro-Cap is crowned with a screw-down retainer to keep all of the plug wires firmly attached to each terminal. 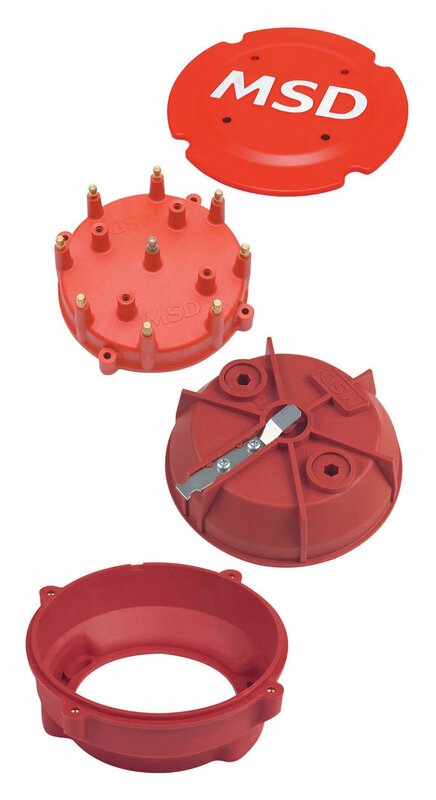 Five inch diameter and 2-inches between each terminal for improved voltage distribution. Injection molded from Rynite for incredible strength and dielectric properties. Plug Wire Retainer holds the wires securely in place.